If you’re planning to load the family up for a camping holiday this summer, but you’ve never camped with the entire family before, then do yourself a favour and read on. We’ve gathered some tips for you to consider as you look for the perfect camping tent to spend a few days sleeping outdoors. The best way to ruin what could be a really fun family camping trip is a bad tent. So make sure you don’t just run out and buy the first big tent you see – take your time to find the best camping tent for your family’s needs so you can be sure to have a wonderful trip. Plus, you’ll get more bang for your buck if you get to utilise the tent again for another trip! Find the perfect size tent for your family. Manufacturers typically only allow 180 x 60 per person. Not much room, especially if someone is tall or has a bigger build! or exterior as it can make a big difference. Allow space for some gear and clothes, since if in the unlikely event of rain while on holiday in Byron Bay, you’ll want extra room to move. Speaking of rain, another big consideration in picking a family camping tent is what conditions you’ll be in while camping. Luckily, in Australia, you won’t have to worry too much about adverse weather conditions, especially if you choose to camp out in the Byron Bay area. However, a tent that can be adjusted for summer months vs. winter months is beneficial. If you’re looking for an all seasons tent, of course you’ll have to plan for wet conditions and make sure your tent is extremely waterproof. No one wants to wake up wet on a camping trip! Seam sealing: Look for tents with seam sealing, this means the company applied a clear seal to make sure no water leaked through the stitch holes. Waterproof rating: Check for a “water head measurement” when shopping for the best family camping tents. Don’t consider anything lower than 1,000 millimetres, but 2,000 is a much better rating. Fabric: Another part of the tent to think about when purchasing a family camping tent is the fabric. Heavy, tough waterproof canvas makes good sense since it is breathable and long lasting. Nylon/polyester tents most likely will be cheaper and, though still waterproof, can deteriorate over time from the sun. Ventilation is key when it comes to avoiding this wet situation. Look for tents with a mesh door and mesh walls (double walls) or windows that can be left open, even if it’s raining. The latter means you’ll need a fly or rain sheet to help drain off the water from both rain and condensation. This article has lots of good tips for keeping condensation at bay so you’ll keep your camping equipment nice and dry. Anytime you look for camping gear you should make sure it’s easy to use. And that’s especially true with the tent since who wants to spend forever putting together the tent once you arrive at your camping site? It’s even more important that family tents for camping are easy to set up so the whole family – especially the kids who will be more than ready to start their holiday – will be able to enjoy some fun sooner rather than later. Fewer poles and pegs mean faster set up, consider inflatable tents for this purpose. Keep in mind that if the tent is huge, then you need a large, level spot to set up camp. So perhaps if you have a large family, it might be easier to go with two tents rather than one large tent. Before you purchase, consider doing a YouTube search for a video on how to set up the particular family tent you want to buy and see how easy (or hard) it is to set up. Now to the almighty dollar and the question of how much to spend on your family tent for camping. Everyone has a different budget, but in this case going too cheap might cost you in the end. Buying a tent that’s cheap means it’s more likely to fail, causing holiday headaches and either ending family camping or the purchase another tent. So go ahead and purchase a quality tent. Now that doesn’t mean you need to spend a fortune, but rather read the reviews (such as this site) and ask around for recommendations. Once you narrow your sights down to one, then shop around and double check to ensure you get the best price for the best family camping tent. Book your family holiday with your new tent at Broken Head! 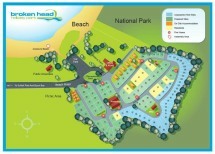 Join us at Broken Head Holiday Park to break in your new family camping tent on a fun, budget holiday in Bryon Bay. Check out our beach campsites (powered or non-powered) and get ready to have a fun family holiday. We look forward to seeing you at Broken Head Holiday Park! Growing up I always went camping, and want to get back into it now that I have kids. I appreciate that you said to get a tent based on your camping situation and the number of people there will be. We won’t be doing any hiking with it, so we’ll probably find one that fits 6, so that the four of us can fit comfortably.